Though touched upon with fleeting moments of grace and drama, The Last Jedi is a somewhat dramatically inconsistent motion picture that builds to particular moments that never quite get the emotional push they deserve, leaving many of the newer characters to be overshadowed by the awesome presence of the nostalgia machine that is Luke Skywalker. A difficult task it is not to review a Star Wars film as a film itself. You come to expect certain levels of drama, wonder, mysticism, humor, and lightsaber-induced excitement; all things that, with the help of a healthy dose of nostalgia, make these films almost immediately enjoyable. What IS difficult, on the other hand, is reviewing a Star Wars film with years upon years of pop culture reference and product saturation sitting on your mind, on top of the fact that this newest film, The Last Jedi, only just about meets the levels of expectation, but doesn't do a tremendous amount more or less than that. As a Star Wars film it sits comfortably middle-of-the-line, which makes for a very back-and-forth "pro vs. con" review of a motion picture with baggage in tow. This review comes with one caveat - this is my FIRST IMPRESSION of the film, and it was my conscious choice to get my feelings out with this review as soon as I possibly could. I did not want to be swayed by the opinions of anyone else and in turn harness the Dark Side (or the Light Side) inside of me. Over time, my feelings may change, but for now, I judge The Last Jedi as a FILM first, and as a Star Wars product second. The biggest problem I have with The Last Jedi is its overall lack of thoughtful, dramatic heft. There were a few moments that I felt the script was pushing towards something deep and emotional, only instead to find a reasonably-suitable twist or turn that surprised me in a "brief shock" kind of way, but immediately veers into a quick resolution that didn't allow itself time to build or draw out. 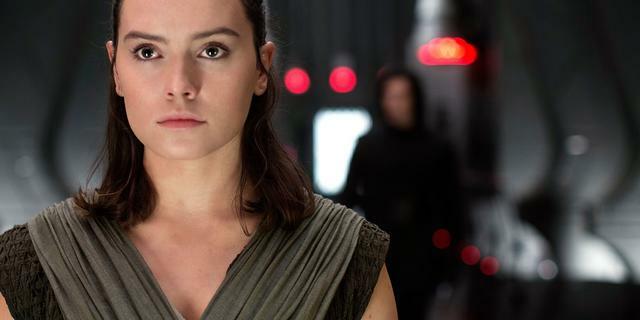 The Rey character (played by Daisy Ridley) is too perfect, and isn't given the amount of danger and dread that Luke had to overcome as he learned the ways of the Force. Instead, she's thrust in the middle of the action without ever really making a wrong step that felt she would be in dire trouble. The tension surrounding her character is all but missing, and that is something an apparent "main character" shouldn't have on their sleeve. Finn and Poe Dameron were nice additional characters introduced in The Force Awakens, but both of their plot lines and progressions in The Last Jedi felt like they took elements from a "Han Solo-type" character and split them into two parts, giving both of them just enough to do when one character could easily have been written to do both. For a film running two-and-a-half hours long (the longest of the series), a few scenes could really have been trimmed down with more of that time being given to draw out the brief bits of tension between Luke and Rey. There are certain uses of the Jedi power and mythos that were confusing to me, given I had never seen such powers used in any of the prior films. Things appearing, things disappearing - some of it felt more "magical" than previously established, with the "science fantasy" that the Star Wars films have been better known for being more a side note. To fill the film's run length, certain characters (including new ones) are given too much time for what results in very little consequence to the overall story. A huge middle chunk of the film, involving a casino-like resort (similar to the Cantina scene from A New Hope, but as inspired by a James Bond film) and the search for a "code breaker" results in an unnecessary action/chase scene, as well as "dramatic" moments given to a new character (in a subplot involving the mistreatment of little kids) that really just wasn't interesting. Some character choices and motivations don't make a whole lot of sense, like a Rebel leader's choice to risk mutiny instead of simply telling her people that her plan is to protect them and disguise an escape. Some "secrets" and decisions characters make or keep from each other appear in direct service to the script, rather than to logic. Some of the story points involving Luke trying to develop Rey's powers felt convoluted and overly-complex. A lot of things start to happen involving Jedi powers (as stated above) that were HUGE driving forces of the plot, but were altogether hard to understand. A major character (one of the more interesting characters in the new trilogy) whom I thought would be more integral to the story is offed too soon. Nearly all of the action scenes involving Finn (John Boyega) were the least interesting of the film. On top of the chase scene on the casino planet, another fight scene aboard a burning starship felt cartoonish and overly glamorized with that overly-CGI feel. Until I can truly judge the film as part of a trilogy (or where Disney decides to take it from here), I felt the final shot was the wrong shot to end the film with. The death of another character happens far too fast, and isn't given the more tender, emotional push it deserved. People often say, "It's in the details" where most films strive. Unfortunately, The Last Jedi needed to greet the bigger picture with something more touching than we were given, and not hide behind as much mystery as it did. Rick Heinrichs, production designer better known for his work on Tim Burton films and others of the twisted, noir type, felt more inspired by a Lord of the Rings or Game of Thrones art exhibition rather than that of its Star Wars source material. This was the first film, even including the prequels, that didn't altogether FEEL like a Star Wars film that belonged in the same timeline. A few of the characters are given decent arcs, evolution, and presence, especially the two main villains. Other characters, on the other hand, are given good "scenes" to work with, but without the passing of time in between this and The Force Awakens, aren't given enough roots to really develop their characters into three-dimensional types undergoing significant change. The return of a familiar old face is welcome, and in no way feels shoe-horned in. Mark Hamill's return to the Luke Skywalker role is fantastic, with character choices that are both surprising and understandable. Director Rian Johnson's choice to make him reclusive and dismissive is refreshing from the a-typical "old hero appears out of nowhere to save the day!" Industrial Light and Magic's closeup CGI on the character of Snoke (played by the always wonderful Andy Serkis) is superb, despite other effects in the film feeling like they were created by a lesser studio. John Williams, again, gives a serviceable score to the film. But, with similar criticism to his work in The Force Awakens, his creative edge in his later years has somewhat taken away from his melodic creativity, with many pieces of music coming across overly-bombastic and unmemorable, but servicing the scenes fine. His score, while typical grand Williams, isn't as emotional or new as his work on any of the prior films. Even his work on the prequels trumps what we hear in The Last Jedi. Steve Yedlin's cinematography is a huge step above the work of The Force Awaken's Dan Mandel, who made that film look too much like JJ Abrams' Star Trek film. I don't mind a singular voice on the film, with director Rian Johnson being the sole credited writer, but this film really could have used a pass-over by the great Lawrence Kasdan to ensure continuity in the Star Wars universe, and to help keep the unnecessary elements at a minimum. Rightfully so, this film only uses the lightsaber when necessary, and doesn't overstay its welcome. One fight scene in particular goes a route I did not anticipate, and was a true gem of a surprise. There are a couple distinct emotional high points in the film, with one relatively dramatic reveal, but there were also quite a few moments that were too-quickly glossed over for the sake of progressing the story to the "action." Kylo Ren/Ben Solo (Adam Driver) may be the best character in the film, even if some of his character arc was assumed by the viewer and not apparently present in the story. I commend Rian Johnson for not playing specifically into the hands of fans that EXPECTED certain things to happen, and instead took a couple original routes with the storytelling elements, both recycling and re-instituting themes from the original trilogy and turning them on their heads in this film. Part of me felt the need to pick at the things that felt off with The Last Jedi, and despite all of the things I've said that were ultimately leaning toward the negative, I can't say this was a bad film. In fact, if you're a Star Wars fan, I overwhelmingly recommend this movie. My personal feelings aside, the film paces itself mostly well and it's two-and-a-half hour run time doesn't feel that long. Luke Skywalker's presence in the story felt right, even if I could have used even a little more - which is a good thing. The last thing you want are characters overstaying their welcome. The Star Wars humor is there, and even as a middle chapter, the film wasn't the expected dour and depressing chapter I was expecting and dreading. To give some context to where my mind was when watching the The Last Jedi, I did an experiment this year for the first time in my life. I avoided ALL previews, behind-the-scenes footage, or forum discussions involving anything with this film. With as high caliber as a Star Wars film could be, I wanted to go into this film with an open mind, and with no visual preconception built in by footage or spoilers given away in the previews or discussions about the film. With that in mind, I was mostly able to criticize the movie as a FILM first, and then as a Star Wars film second. Regardless of my approach, there are still many things I looked forward to that had nothing to do with the film being inherently Star Wars - and I was both pleased AND disappointed. I was pleased with some of the original choices Rian Johnson took with established Star Wars canon, but also disappointed that so many lines of dialogue from previous films were tinkered with, repackaged, and spoken with less conviction by characters who didn't have the dramatic weight or emotional context to truly believe what they were saying in the situations they were in. The film for sure needed another voice to help guide the script into a more centered, simple, and personal story rather than one that bombards its audience with constant action and quickly-exchanging lines of dialogue between characters who are too many; some characters of which are introduced and concluded in this film alone, in moments that more dramatically could have been left either in the final film of this new trilogy, or given to a more established character in the franchise altogether to give their actions more heft. A major issue that the film makers were going to run into was the fact that a lot of the Star Wars wonder comes from the original source - the nostalgia of the Skywalker saga - and not that of the newer characters. Luke was the character of discovery for us as the audience to relate to, so obviously we are going to do the same in this film. Where the film both tries to succeed and ultimately finds a middle ground is in giving more time to the newer characters without over-utilizing Luke. The downside is that all of Luke's scenes were the more interesting, because, let's be honest - Star Wars as a franchise is good when it adheres to what we know, and there's not going to be much changing of that. The Last Jedi as a sequel works, for the most part. As a stand-alone film, it fails. It has some riveting action set pieces, a few neat surprises, and a couple shots that could easily go down as some of the most iconic of the franchise. The unfortunate part is that a lot of the moments in the film that were building toward something heavy and dramatic fall short, with too much time spent away from the characters who really needed more time to develop. Interesting characters don't need giant explosions to maintain audience interest, and I could sense Disney was trying NOT to make this film too dramatically heavy as to not scare children away, which is saddening. In the end, my feeling is that The Last Jedi needed to be set apart from its previous film a little more, and not be a direct linear sequel. Like The Empire Strikes Back or Return of the Jedi before it, we needed a space in the timeline between The Force Awakens and this to better establish a growth in characters both Light and Dark that didn't require us seeing in order to believe. As it stands, The Force Awakens and The Last Jedi feel like one long movie rather than two distinct parts. The Lord of the Rings was able to get away with that, but Star Wars suffers because of it. I'm sure in time, this film may grow on me with future revisits, but as it stands, it's a slight step back from the dramatic efforts and the growth of simple, relateable themes introduced four decades before. This is very much feeling like Disney's Star Wars of contemporary film tropes and cliches, and not the Star Wars we grew up with. Parts of me feel like Disney is less out to tell an actual story than they are trying to expand the moneyed franchise beyond the Skywalker saga, which is evident in the film's hints that the Force exists beyond the pre-conceived notions that the powers are hereditary. The Force is strong with Skywalker, and this film needed a little more Skywalker. RECOMMENDED FOR FANS, but AVOID IF NOT A FAN OF "STAR WARS"
Peacemaker Reviews - "Spider-Man: Homecoming"